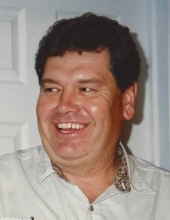 LATHROP, James L. "Jim" - Age 70, of Linden, died March 29, 2019. No services will be held. Jim was born January 15, 1949 in Flint, the son of Robert and Betty (Lee) Lathrop. He was a veteran of the U.S. Navy. Jim owned and operated Ken Lee Well Drilling with his brother. Surviving are his wife, Nora Janice Lathrop; son, Matt Singer; brothers, Corky Lathrop and Tim Lathrop; sister, Amy (Brian) Ensell; several nieces and nephews and his dog, Pierre. He was preceded in death by his parents and daughter, Rachael. To send flowers or a remembrance gift to the family of James L. "Jim" Lathrop, please visit our Tribute Store. "Email Address" would like to share the life celebration of James L. "Jim" Lathrop. Click on the "link" to go to share a favorite memory or leave a condolence message for the family.